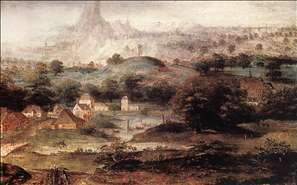 Netherlandish painter of landscapes with figures. He is an enigmatic figure presumed to be one and the same as the Herri Patenier who entered the Antwerp Guild in 1535. Herri met de Bles, as van Mander informs us, is simply a nickname meaning Herri with the white forelock , and it is generally assumed that he was a relation of Joachim Patenier, who certainly had a decisive influence on his work. 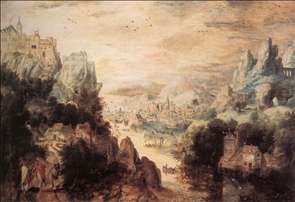 No signed or documented work by Herri exists, but a small group of distinctive works has been ascribed to him, characterized by panoramic landscapes dominating the figure groups in the manner of Patenier. His work was popular with Italian collectors, who called him Civetta (little owl) because he often included owls in his pictures. 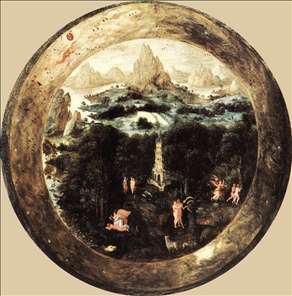 See more details about "Landscape with Christ and the Men of Emmaus"
See more details about "Landscape with the Banishment of Hagar"
See more details about "The Paradise"